Arriving in Killarney town centre a little after nine to grab a packed lunch and a cup of tea from Cafe Lir, I got a lift with Nathan out to Kate Kearney's Cottage where the group was meeting. Warm handshakes and introductions were exchanged between the eight climbers (and Nathan), and everyone commented on the bit of sun that was trying to peek through the clouds. Then it was down into the Gap of Dunloe, pulling off the road at a rock-face for the day's climbing. Everything was already set up for us, so we just had to get our harnesses on, and receive a few basic tips from Nathan, and then we were away climbing! We took turns at climbing, belaying (holding the rope at ground level to support the climber), backing-up the belayer, and flaking the rope. From the off, everyone was involved, each with a role, and learning how to do each part. Nathan was on hand at all times, dishing out helpful advice, and showing us the ropes (so to speak!). Everybody encouraged each other on the climbs, trying to spot new foot and handholds from the ground. After clambering up Cronin's Crack one last time, he taught us how to pack the equipment so that it would be tangle-free in the morning. Back to my B&B in Robeen House for a nap, and then a night out in Killarney! The next day we were a little further away from the road, and higher up, giving us spectacular views of the Gap and the lakes. The emphasis today was on technique - smearing, crimping, side pulls, mantel pushes - all had to be used to scale the day's climbs. We also learned a few knots - the Italian Hitch, Clove Hitch, Double Figure of Eight - and a new method for belaying. At the end of the day, we had a quick review session. It was already pretty obvious how much our climbing ability had improved - instead of hauling ourselves up the rocks using big obvious ledges, we were taking our time, looking around for the slightest of handholds, and even smearing up the sheer cliff face! But on top of that, everyone was far more comfortable with the idea of climbing - those with a fear of heights knew that they were safe and secure, and we all knew to do our safety checks. All in all, a fantastic way to spend a weekend, and I'm already looking at doing the improver's' course as soon as possible! Thanks to Nathan and Ruth at Outdoors Ireland, and Roisin at Outsider Magazine, for two days of superb fun! Kayaking across Lough Leane this week; largest of the three Lakes of Killarney, with Purple and Tomies Mountains in the background. Here's the links from the journey I undertook in January, from Kerry to Tipperary, with Bob the Goat and Cara the Dog. Spend a morning exploring the deep, sparkling Lakes of Killarney by kayak or canoe! Beginning at 15th century Ross Castle, paddle into Lough Leane, discovering wooded islands, limestone caves and local history. With an experienced, qualified guide learn the skills to master your boat and savour the spectacular views of Killarney National Park. Climb through glaciated corries, past deep mountain lakes and along ice-carved ridges to stand on Carrauntoohil's lofty cloud-strewn summit! From the top of Ireland's highest peak savour breathtaking views over the Iveragh, Beara and Dingle Peninsulas, as far as Skellig Michael and the Blasket Islands. Discover legends and local history with an experienced, knowledgeable guide. On a misty day enjoy the excitement of swirling cloud, piercing rays of sunshine and the occasional treat of views revealed through a friendly parting in the clouds. 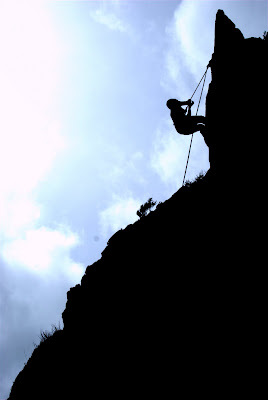 Photos from one of our Learn to Rock Climb Courses in the Gap of Dunloe, last weekend. Stand on Ireland's highest mountain, explore the limestone caves of Lough Leane by kayak or learn to rock climb on sandstone cliffs in the Gap of Dunloe! At night discover the craic, gourmet food and lively entertainment of Killarney, as you enjoy some well-earned relaxation. 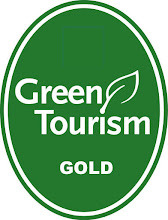 Kerry Adventure Company ‘Outdoors Ireland’ have just achieved a gold award for environmental awareness and green thinking. Outdoors Ireland were part of a pilot project, run in Kerry in association with Failte Ireland, aimed at ‘greening’ tourism businesses, from guest houses to adventure companies, and were part of approximately fifty businesses who completed their certification process earlier this month. The current green initiative Outdoors Ireland are focusing on over the summer months is ‘Bring Back 2’. We've teamed up with Scotts Hotel, to give away two days of adventure activities plus overnight accommodation and dinner in the luxurious, town centre hotel. Scotts Hotel is a deluxe Killarney hotel, combining luxury, service and great value deals right in the heart of Killarney. With extravagantly designed bedrooms, deluxe suites and plush self catering apartments, guests can indulge in cozy comforts during their stay, while exploring the Killarney Lakes by kayak and tackling the sandstone cliffs of the Gap of Dunloe. To enter email info@outdoorsireland.com with an answer to the following answer: What is the restaurant at Scotts Hotel called? We'll announce a winner on Monday 26th July! 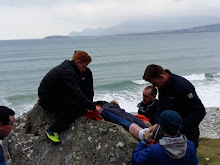 To celebrate our continued success and to thank you for your support, we are offering a week of adventure activities and outdoor training in the rugged mountains and ice-carved lakes of Kerry, where you pay what you like. We have plenty to celebrate! Each of the past five years has been busier than the previous year; our facebook group has surpassed 1,000 members and is growing fast; our Singles Adventure Weekends recently featured on RTE’s Nationwide; and we just achieved a Gold Award for Green Tourism Business. So for one entire week in August, we are offering all scheduled activities on a 'pay what you like' basis. You simply give what the trip or course was worth to you, or what you can afford to pay. As well as thanking existing customers, whom we value hugely, we would also like to give anyone who is hurting from the doom and gloom of recession blues a chance to experience the fun, relaxation and adrenaline of outdoor sports. More and more people in Ireland are heading for the hills and rivers, and are tending to holiday at home. Many, however, don’t know where to go to get started in adventure sports, or might have reservations about their fitness level, or whether it’s really for them. This week will allow anyone, regardless of ability, the chance to try our activities and pay what they like for the experience. Of course, our facebook group members and loyal customers come first, and will have the chance to book before we go public. Bookings for existing customers are now open, followed on Monday 19th July by bookings opening to the general public. Places are limited so once you're booked we need you to attend, whatever your circumstances, and guarantee that you won't cancel. 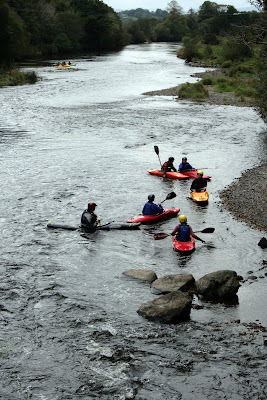 We're running river kayak trips over the summer and autumn on the Laune River, flowing from the Killarney Lakes all the way down to Killorglin. These are full-day kayak trips, beginning at Ross Castle and finishing with the rapids at Beaufort Bridge. You will spend the morning learning kayak strokes and techniques as you paddle across Lough Leane, stopping for a picnic lunch along the way. Then as you paddle down the swiftly flowing Laune River you will have the opportunity to put your new skills into practice as you tackle the moving water, river bends and friendly, splashing rapids. I've two places to give away for a guided ascent of Carrauntoohil this Sunday 11th July, ascending via O Shea's Gully or Caher Ridge. If you had to spend 24 hours on Carrauntoohil what would be the one thing you'd bring to make your life easier? I'll pick a winner this Thursday evening. Good luck! On Monday we provided Safety/Rescue Cover for a UK Charity, Water Aid, who had a group of approx 70 climbers completing a Six Peaks Challenge. After being on the go for nearly 72 hours, Carrauntoohil was their final mountain.